Bluford Series "Shattered" Chapters 7 and 8 quizzes. 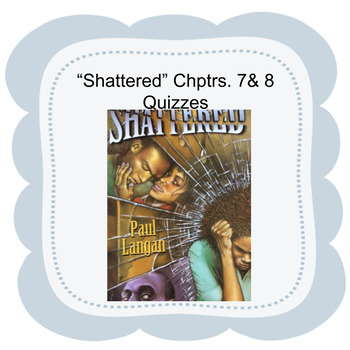 Multiple choice quizzes with page numbers included for chapters 7 and 8 of the Bluford Series novel "Shattered" by Paul Langan. 12 questions for chapter nine, 9 questions for chapter 10. Links are provided to the self-grading google drive quizzes so you can email them to students or share them in google classroom. PDFs and answer keys are also given in case you prefer to print. I use these simple quizzes to engage my reluctant readers in the novels. Great for literacy centers, individual reading assignments, or group lessons.